"Well well,what do we have here,Primera Espada Coyote Starrk.Huh should be fun *grin*"
Starrk looks at you with an annoyed expression on his face, he unsheathes his sword and points it at you. "lets get this over with, shall we?" "I see your getting into it pretty quickly,this aint like the starrk I heard of*grin*"
As you approach me I grip the hilt of the sword tightly with my left hand,while infusing SP into my right arm,as soon as your leg is motioning towards my head I calmly move my head back,dodging it. "You know,I could have used my sword right there and cut you in 2"
P.S- dont try to describe a way to dodge the punch,because in your position there would be no way too.Don't worry,the punch wouldnt even scrach your hierro. The second you move your head backwards, Starrk sees an opening to release all the build up Reiatsu in his right leg, as a powerful Cero, as you get trown backwards, he gets back into a regular stance and points his sword at you. "What a terrible way to dodge, tsk tsk tsk." 2. Nice job not listening to me, I was hoping you wouldn't blindly listen to me and think your own way out. "that was close,I took you too carelessly.How about we both get serous? 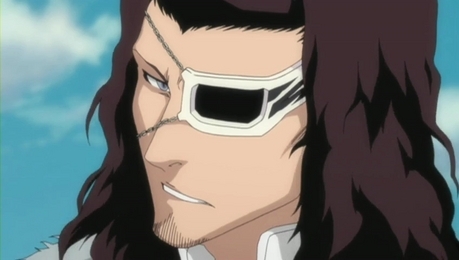 *grin* "
Starrk stares at you with a dull look on his face. "Do we have to get serious? We could just take it slowly and build up some excitement." "But you seem pretty determined, lets do this. Kick about, Los Lobos!" 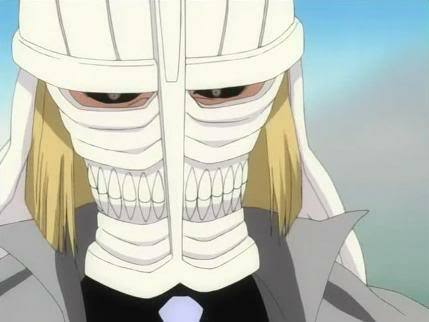 As you equip your mask, Starrk activates his rebirth and changes appearance and power drastically. So as you fire your Bala, he simple points his bandoleers at you (i'll call them guns from now ~_~) and fires a barrage of Cero's from them, these will cancel your Bala out and continue towards you. "I am kinda in a hurry,sorry.However if you do survive for 5 minutes(moves) then I will show you...the power of my sakanade*grin*"
"come and catch me :P"
As you stand there long range away, Starrk charges you, while charging incredibly amounts of SP into his left leg. As he gets into mid range, he uses Sonido to appear 5 meters beneath you in a lying position, as he appear beneath you, he kicks upwards releasing all the SP as a hard slash, that's flying towards you with high speed. The second he releases the SP, he uses Sonido to appear 5 meters above you, and the second he appears, he shoots a fuses dual shot at you with his guns, and then he sidesteps to the right, and releases another barage of Cero's at you. As soon as you use sonido,since its long range,I react quickly and as you start to release your reatsu I release my own(since I am in vaizard mode it would equal yours),then I predict where you might appear and charge a bala in my hand and as I sense you above me,release it at you.Overpowering your plain reatsu and hitting you at high speed,or at least troubling you,also preventing you to continue with the cero barrage. "tsch,that was close,too close.Well then,you have 4 more minutes(moves) before I activate sakanade...and then its over *grin*"
Why isn't this in the rules? I know it would be too troublesome to write the cost of every technique, but it would've been smart to tell me that the barrage is a high level technique the first time i used it. Why is the barrage a high level technique? Cause it seems to me that Starrk can keep doing it. The great amounts of SP you release to counter mine costs points too right? I'm not trying to be annoying, i'm just curious, and i'll be able to use the answers as future references in battles. As you charge the Bala in your hand, Starrk looks at you with a sad face, and summons a pack of wolves beside him. These wolves are fractions of Starrks soul and NOT made of Reiatsu, therefor i do not think they cost any Reiatsu to create, this is also stated in the technique itself on Bleachwikia. "Starrk seems to be able to summon them without limit, thus overwhelming the enemy with their sheer numbers." Just before the Bala is fired, Starrk points one of his guns directly at the technique, and as the Bala is shot at him, he shots a Cero at it. he Cero takes some of the damage form the Bala, and Starrks Hierro takes the rest. As you fire the Bala, the wolves run at you with extreme speed, and they run right beside the Bala so you're almost unable to see them, as they get close to you, they blow up causing a violent explosion. As the Bala fades away, Starrk stand above you and looks down on you, he flies a bit backwards to put some distance between you (Mid range), but he remains 5 meters above you. Answer: that because I didnt make all the techniques for cannons yet. Too busy to do the test,and I see you qualify. Mugen,i need you on MSN.